Carbon dioxide, otherwise known by its chemical shorthand CO2, is a naturally occurring gas that's present in the air we breathe. This gas is essential to life on earth: It's a vital component of both photosynthesis and cellular respiration. Among its many uses, CO2 has the ability to put out flames and is therefore used as the extinguishing agent in both portable and fixed-installation fire extinguishers. An examination of its properties and uses shows why it's a popular choice for suppression of most, but not all, types of fire. CO2 is a colorless and, in normal concentrations, odorless gas. It doesn't react with burning materials, so it doesn't create any toxic or other by-products when used to suppress a fire. It's therefore a clean gas, meaning it leaves no trace of its use when suppressing a fire. Carbon dioxide doesn't conduct electricity, making it an ideal fire suppressant for use in computer rooms, electrical distribution stations and other locations where a large amount of electricity may be present. CO2 acts on fires in two ways: The release of the gas under pressure has a cooling effect, as can be seen by the resulting mist cloud and ice particles; the gas also displaces the oxygen that's necessary to maintain combustion. CO2 is effective on liquid fires, gaseous fires and electrical fires (American classes B and C and International classes B, C and E). The gas is particularly useful for electrical fires as it's non-conductive and leaves no trace after its use (as would be the case for foams or other gases). However, CO2 is not recommended for general fires, as it's emitted under high pressure; light burning material, such as paper and wood, could get blown around, possibly worsening the situation. Fixed CO2 fire-suppression systems are often installed where the risk of fire from burning liquids or gases is high, such as at gas stations. Businesses will install CO2 fire-suppression systems in enclosed areas such as computer rooms or electrical switch rooms. Many ships have these systems installed in their engine rooms. CO2 may have health risks. At high concentrations, CO2 can become toxic or even lethal. According to the Environmental Protection Agency, in an enclosed space that has been subject to fire suppression, the typical resulting concentrations of CO2 of 17 percent or more can cause loss of function, unconsciousness and death within a minute; lower concentrations can cause confusion, dizziness, headaches and nausea. It's important that any enclosed area that has been subject to a fire-suppression incident is evacuated immediately. A CO2 fire extinguisher that's discharging will cool quickly, creating a frostbite risk to the operator, who should take care to touch only the handle and the nozzle and avoid the metal parts of the extinguisher. 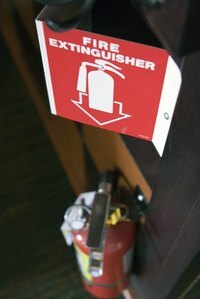 What Type of Fire Can a CO2 Extinguisher Put Out? What Is a Nitrogen Compressed Fire Extinguisher?